An off-duty cop stopping at a gas station to get a bite to eat stumbled upon a robbery in progress early Thursday, then shot one of the two suspects, prosecutors say. 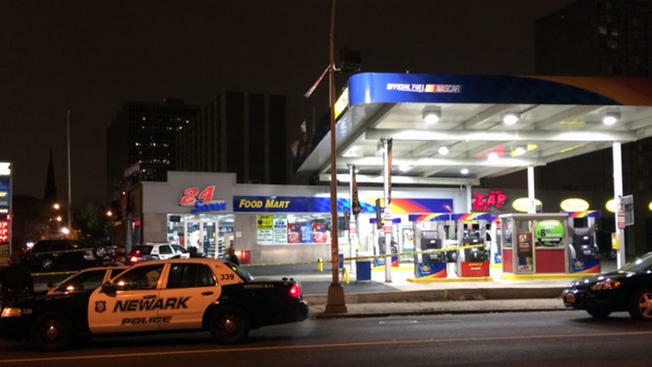 Two masked robbers had burst into the Sunoco at Washington and Court streets at about 12:45 a.m., pointed a gun at the clerk and demanded money, a gas station worker told NBC 4 New York. When the clerk said there wasn't any cash in the register, one of the bandits jumped over the counter and started tinkering with a safe. While the robbers were in the store, the officer pulled into the gas station. Another worker at the station waved at the off-duty cop and told him that there was a robbery inside the store. The cop went inside and opened fire, critically injuring one of the men, according to prosecutors. The other robber, meanwhile, was detained at the scene. The officer wasn't injured in the shooting. It's not clear if the robbers opened fire.